Do you ever need to get directions on maps, of course, we all do! 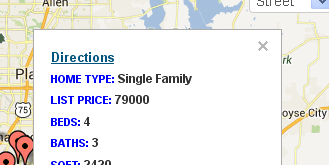 Our service makes getting directions on your map a couple clicks away once you have your map rendered. To get the directions form, click on a marker to open up the description. 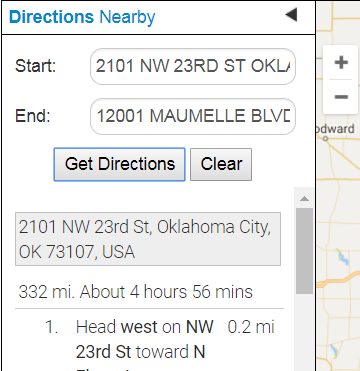 Click either the title, address, or directions link to open a window to get a route from the opened marker to another location. The address of the clicked marker is automatically provided, enter another address to display the route on the map. Enable "directions & nearby filter"
If the map has been generated click "Update Map"
Fill in the Start and End values (or click on pins) to get the directions (image below). In many cases, such as on mobile devices using Google Maps itself or another map app (for mobile devices) can provide real time navigation for directions. Use Google Maps or an app for directions by selecting the Google Maps Directions checkbox when creating the map. When clicking on the address Google Maps will open with the address of the pin as the ending point and the current (device) address as the starting point.